Users can configure all user-specific information in their account. It should be noted that if the Master Key process is used, user data will always be taken from Active Directory – editing this information in Password Safe is thus not possible. All of the information in the contact and address sections can be defined under “Edit profile”. Some areas of the profile overlap with the management of users. This information is explained in a separate section. *No changes can be made to users that were imported from AD using Master Key mode. In this case, all information will be imported from AD. A new image can be added or the existing one replaced or deleted by clicking on the profile image. *No changes can be made to users that were imported from AD with the aid of Master Key mode. If an image has been saved in AD, it will be used here. It is recommended that the user password is changed on a regular basis. If you want to use a new password, it is necessary to enter the existing password in advance. The strength of the password will be directly displayed. *Users who were imported from AD with the aid of Master Key mode log in with the domain password. Therefore, no password can be configured in this case. Multifactor authentication provides additional protection through a second login authentication using a hardware token. The configuration is carried out via the ribbon in the “Security” section. More…. 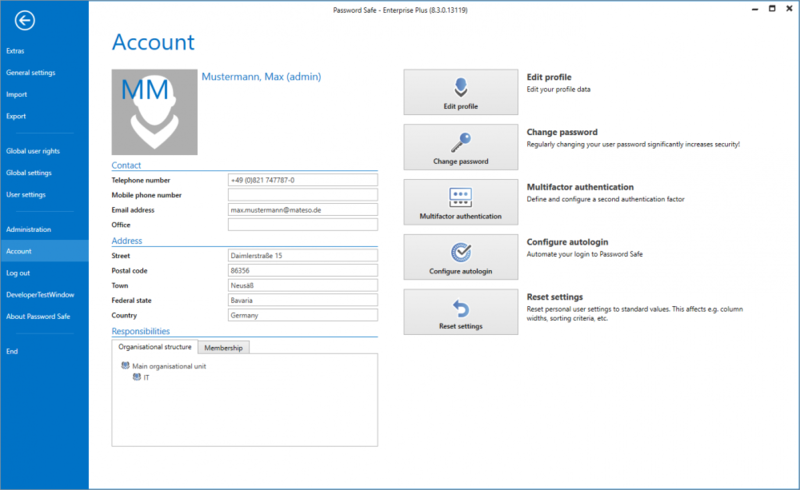 This option can be used to automate the login to Password Safe. For setup, just enter the password twice and save it. *The autologin is linked to the hardware and thus will not work on a different computer. If you change the hardware or the hardware ID, an existing autologin needs to be recreated. !The automatic login should be handled as a process critical to security. It is important to note that all data can be accessed, for example, if you forget to lock the computer. *For security reasons, the autologin is only valid for 180 days and then needs to be subsequently renewed. Clicking on this button resets all user-specific settings such as the column width, colour scheme, etc. to the default values.